A number of significant Roman Period buildings and artifacts were excavated by the University of Michigan expedition to Karanis. 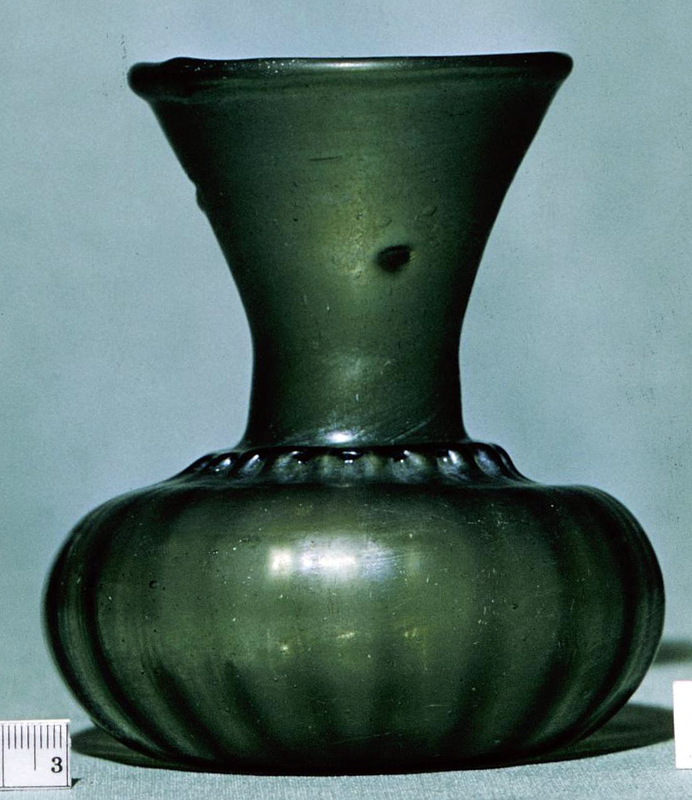 Conical glass oil lamp resting in a wood stand from 1st to 4th century AD deposits at Karanis. 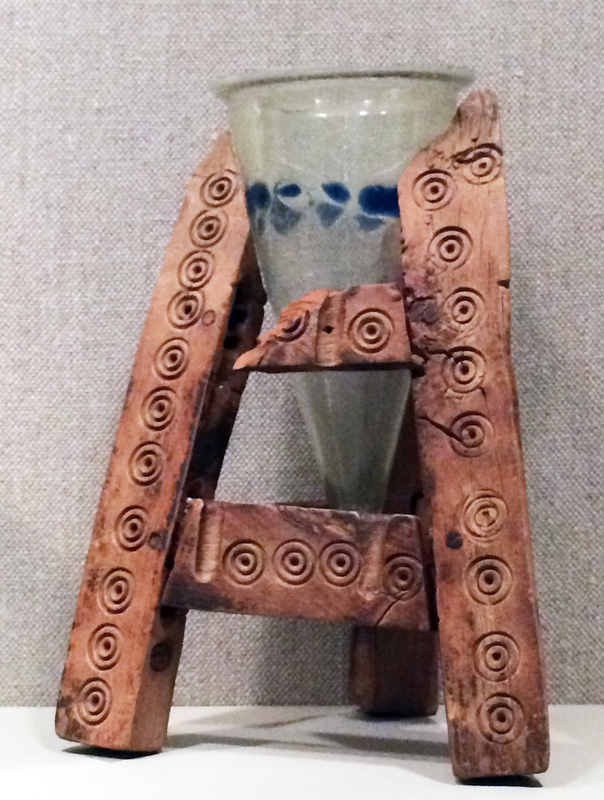 The lamp is decorated with both horizontal wheel incisions and blobs of blue glass. 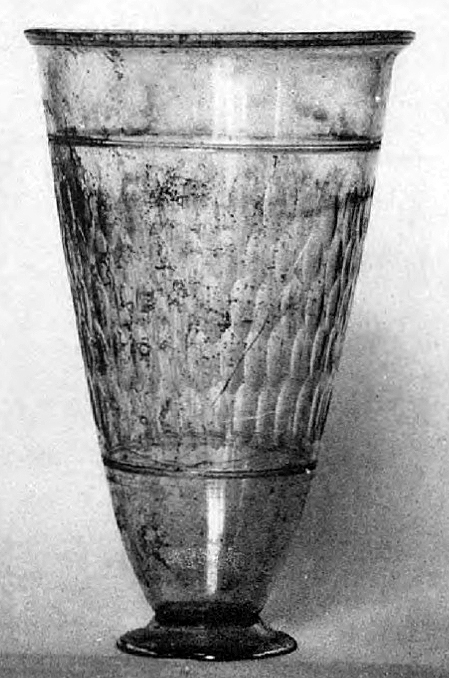 "Blobs" is the term used in the published report on the glass from Karanis! Image from the Kelsey Museum on-line data base. The reg. no. 5929 for the class lamp; height = 13.5 cm and rim diameter =7.9 cm. Reg. no. 3633 for the wood stand from excavation unit 0254 at Karanis. Height = 18.6 cm and width = 14 cm. The Kelsey Museum description is fascinating: "Three legs joined by double crosspieces on each side (one crosspiece missing.) All pieces have concentric circles - the crosspieces additionally have gouges which may indicate their previous use as a weaving tool. Pieces joined by wooden pegs." Two more wooden lamp stands (reg. nos. 7424 and 7661) are recorded in the database of finds from Karanis. 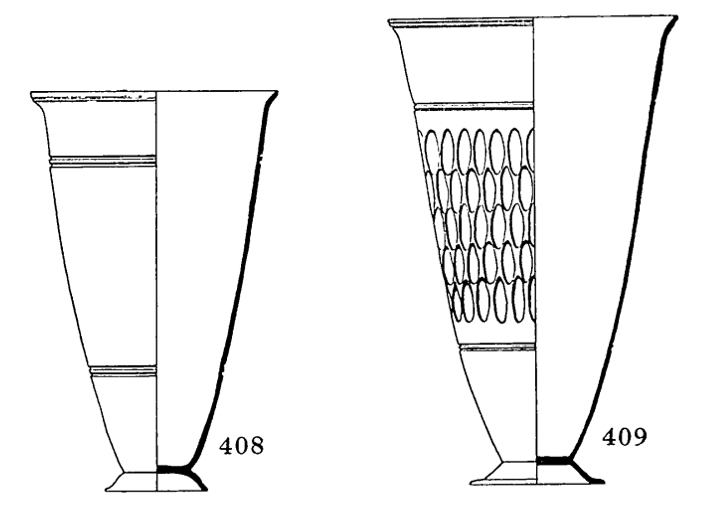 Drawings of conical lamps from Karanis. Plate XVI.436, green glass height = 20.3 cm and rim diameter = 8.3 cm. Plate XVI.438, greenish colorless glass height = 12.5 cm and rim diameter = 6.3 cm. Plate XVI.440, dark greenish yellow with blue blobs height = 9.2 cm and rim diameter = 6.8 cm. Plate XVI.449, sea green glass height = 11 cm and rim diameter = 5.5 cm. Plate XVI.455, olive green glass with wheel incisions height = 13.3 cm and rim diameter 9.2 cm. Plate XVI.457, yellowish green with blue blobs height = 20.8 cm and rim diameter = 12.3 cm. 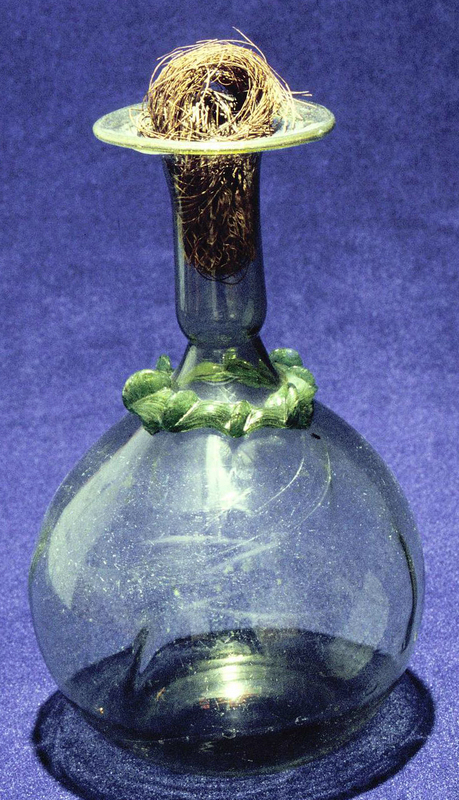 Wheel-cut glass bottle from excavation unit C0084 at Karanis dating to the 3rd - 4th century AD. Image from the Kelsey Museum on-line data base. Reg. no. 5947. Height = 19.7 cm and body diameter = 10.1 cm. 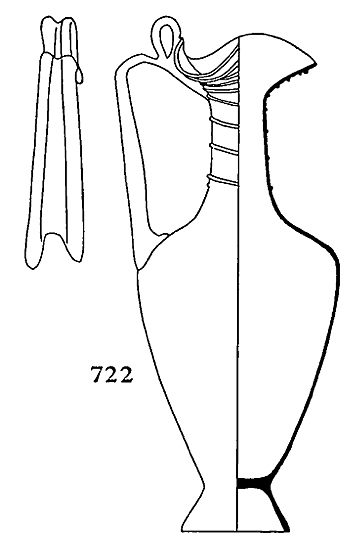 Drawing of the wheel-cut glass bottle from Karanis published by Harden (1936: Plates XIX.739). Reg. no. 5947. Three glass drinking cups from Karanis published by Harden (1936). Plate XVI.479 Olive green glass height = 9 cm and diameter = 7.2 cm; reg. no. 5963. Plate XVI,482 yellow glass height = 8.5 cm and diameter = 7.5 cm; reg. no. 5551. Plate XVI.484 olive green height = 8.8 to 9.3 cm and diameter = 6.9 to 7.5 cm; reg. no. 5965. 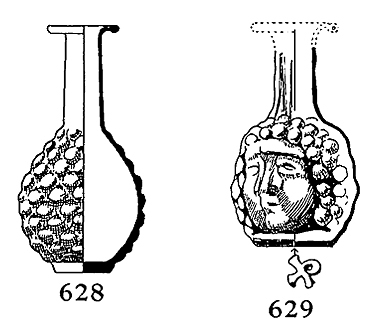 Two moldblown glass flasks from Karanis published by Harden (1936: Plates XVIII.628 and 629). Left: height = 9.2 cm and diameter = 4.8 cm; reg. Cairo J 51406. Right (Janus faced): height = 8.5 cm and diameter = 4.8 cm, reg. no. 6181. Glass bowls from Karanis published by Harden (1936). 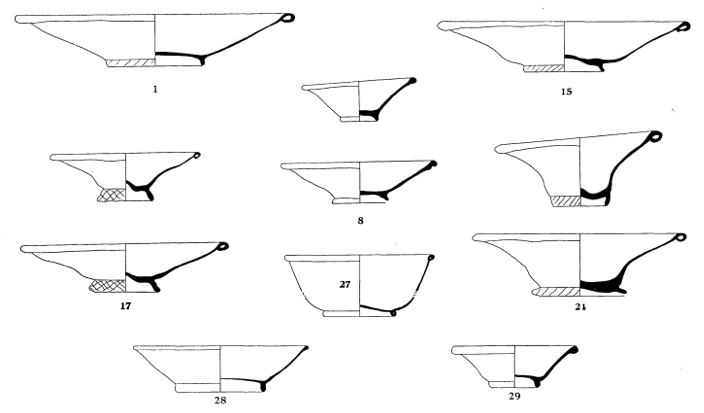 Deep bowls from Karanis published by Harden (1936). 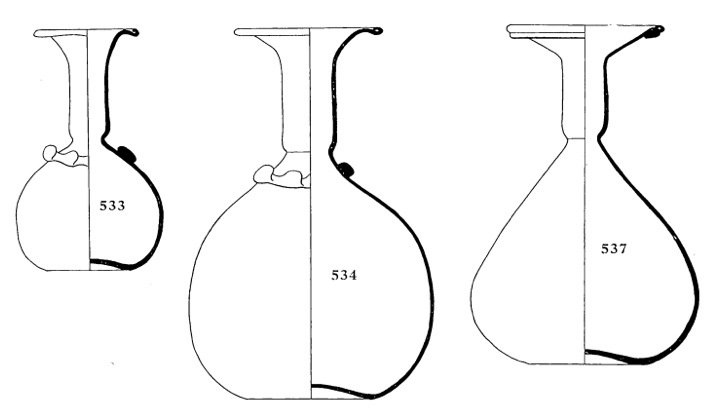 Three glass flasks from Karanis published by Harden (1936). 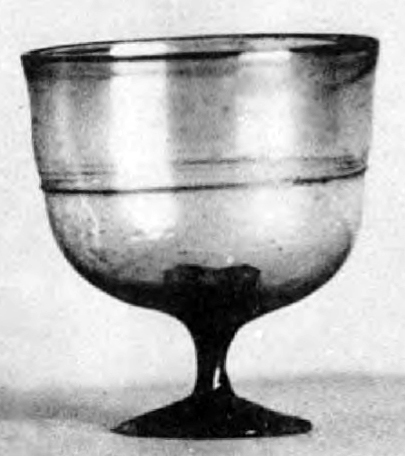 Footed glass goblet from Karanis published by Harden (1936). 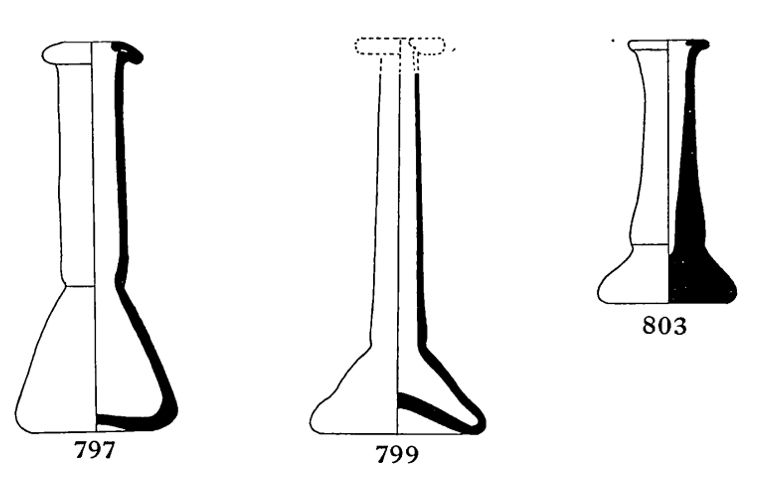 Two footed glass globets from Karanis published by Harden (1936). Glass jar from Karanis published by Harden (1936). Glass plate from Karanis published by Harden (1936). 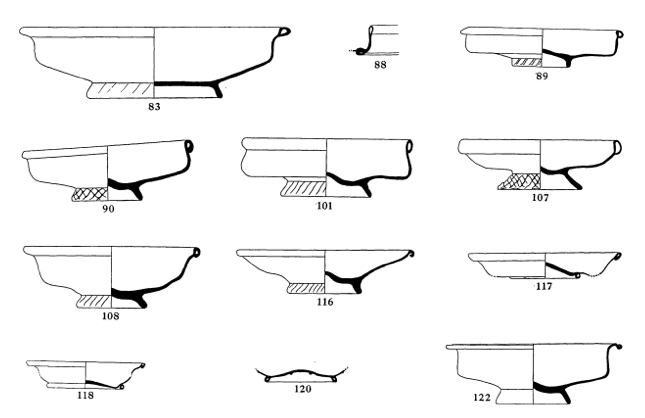 Shallow bowls from Karanis published by Harden (1936). 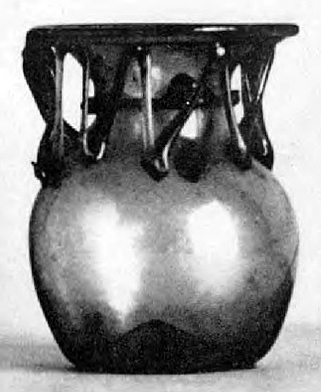 Glass bottle with trefoil rim and applied glass threads from Karanis published by Harden (1936). Three glass unguentaria from Karanis published by Harden (1936). Glass flask from the surface at Karanis. Image from the Kelsey Museum on-line data base. Reg. no. 6257. Height = 18.9 cm and body diameter = 11.8 cm. 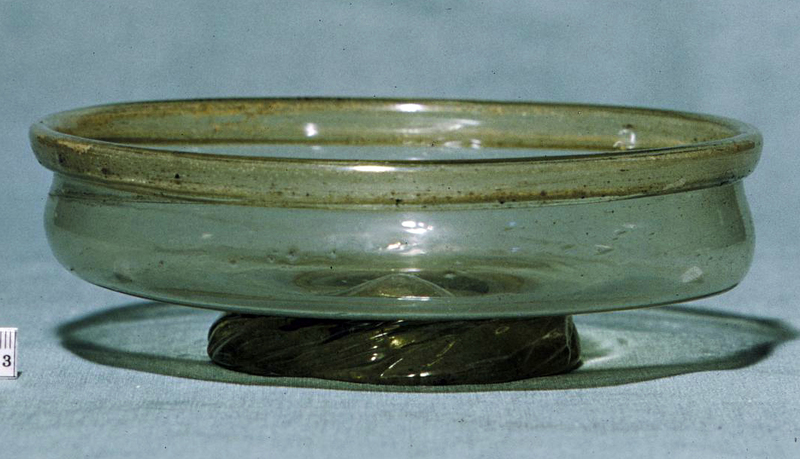 Glass bowl from excavation unit C0056 at Karanis. Image from the Kelsey Museum on-line data base. Reg. no. 5902. Height = 5.2 cm and diameter = 15.9 cm. 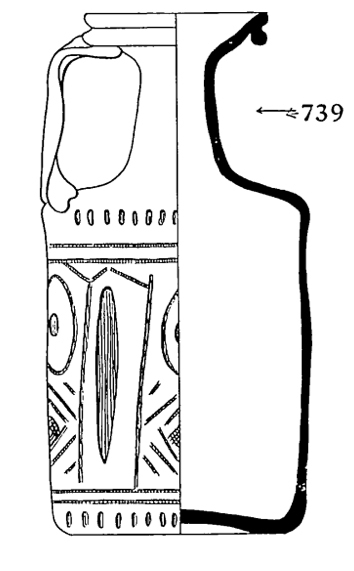 Glass flask with a reed stopper from excavation unit 0209 at Karanis. Image from the Kelsey Museum on-line data base. Reg. no. 5936. Height = 25 cm and body diameter = 16 cm. 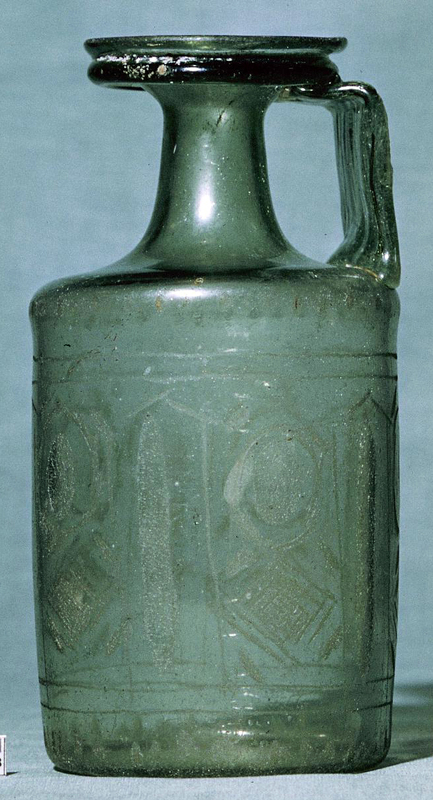 Glass flask from the surface of excavation unit 24-X at Karanis. Image from the Kelsey Museum on-line data base. Reg. no. 5574. Height = 11.5 cm and body diameter = 10.2 cm. 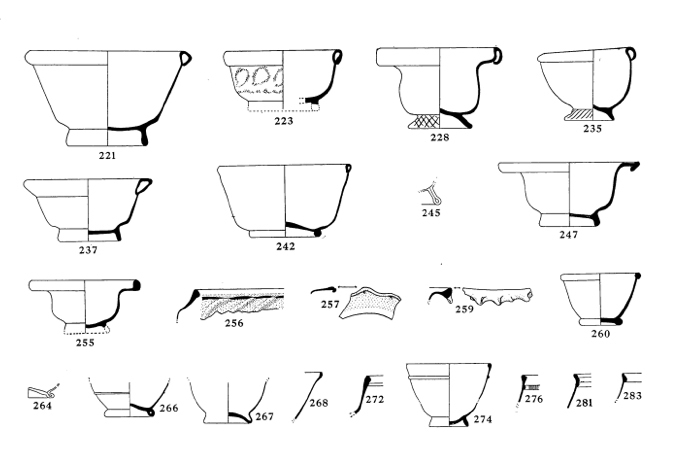 Harden (1934:145) notes that 37 glass vessels were found in a single structure where some were "stored in jars (and) some propped up against the walls." The range of forms included 8 oval bowls, 16 (round?) bowls, 5 conical lamps, 2 drinking cups, 2 jars, 2 flasks and 2 jugs. 1934 The Glass of the Greeks and Romans. Greece & Rome 3(9):140 - 149. 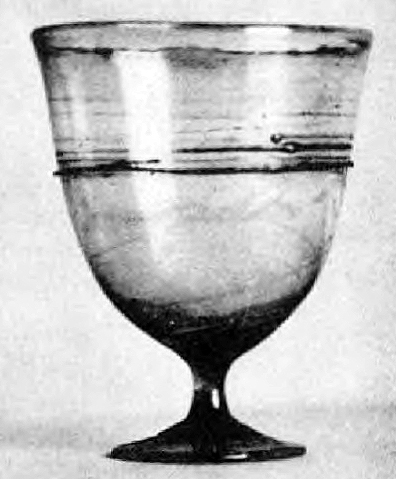 1936 Roman glass from Karanis. University of Michigan Press, Ann Arbor.